Come Savor the peaceful days of Rendezvous along the South Dakota and Minnesota border! Nestled in a small, wooded ravine with a creek running through the middle of camp, 4-Moons is a home-away-from-home in true rendezvous fashion. Newcomers are quickly welcomed into the fold as the family continues to grow. Traders are welcomed to camp alongside family camps. Camp meetings are held according to schedule developing a wonderful sense of unity. 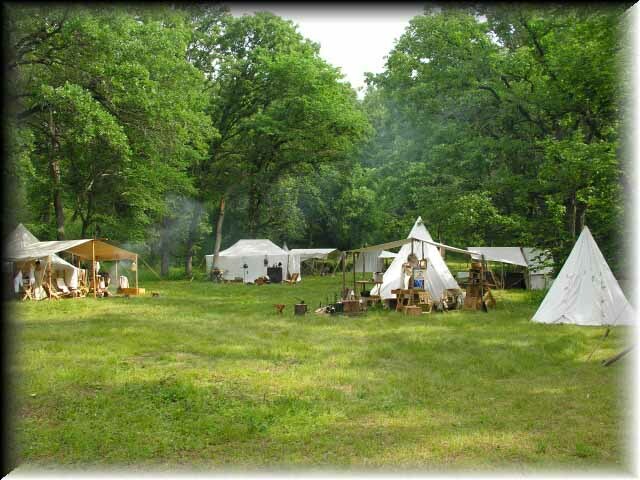 Shoots, archery, hawk & knife, cooking contests and other games of skill and luck daily. Kids games and candy cannon. Wood, water, privies and showers on site. 4-Moons prides itself on giving away scores of prizes for contests and drawings, silent auctions, and a variety of other opportunities. Copyright 2002-2019 - 4-Moons Rising Rendezvous. All rights reserved.